My Son's Husband is an amiable sort of show. Adapted from Daniele Falleri's 2012 Italian play Il Marito di Mio Figlio, Raffaele Cericola of Night Express Live brings a distinctly European brand of high-strung familial farce to the London stage. Translating comedy effectively is a tricky task, especially from Italy to Britain: two countries with distinctive ideas of what's funny and what's not. 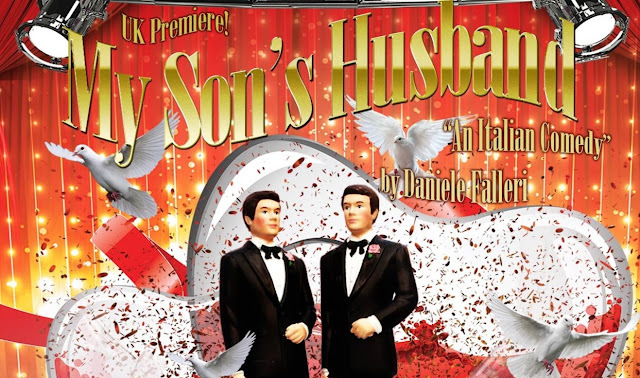 The play centres around the impending marriage of George (James Pacileo) and Michael (Federico Moro), two besotted twenty-something Italians. We meet them as they nervously await the arrival of their respective parents. Waiting for the in-laws is a series of dramatic revelations: not just that their children are getting married but that, *gasp* they're gay! George's parents are brusque, working class conservatives made good. His sturdily built father Ignacio (Tino Orsini) runs a successful tannery and his mother Maria (Yvonne Wickham) is a brassy housewife. Michael's parents tend to the neurotic; his Dad, Agostino (Roberto Benfenati) is a nervous wreck and his mother Amalia (Stefania Montesolaro) is a wistful 60s radical. Each parent processes their sons' sexuality in different ways. George's burrow deeply into denial, frantically searching for ways to 'prove' he's not really gay and researching methods to convert him back to heterosexuality. Michael's are somewhat more supportive, but quickly discover that the situation shifts the ground under their own marriage. Tossed into the mix is waitress/psychology student/would be actor Laurie (Irene Possetto), a flirty ditz who George's parents see as the ideal decoy to lure their son back to straightness. For the most part, My Son's Husband proceeds precisely how you'd expect. Farces tend to work in stereotypes, and this play is crammed with them: the gay men want to be fashion designers, the gruff vest n' chain wearing patriarch is a casually homophobic lothario, the mothers bitchily exchange remarks on each other's appearance and so on. That archetypal nature, combined with an obvious reverence for La Cage Aux Folles and the films of Pedro Almodovar (who's name-dropped constantly) makes for a familiar experience. From the moment we meet these characters we know where they're going and have a pretty damn good idea what the final scene will involve. But, then this is a comedy - the narrative isn't half as important as whether it makes you laugh. Mark Kermode, a critic who have an awful lot of respect for, has a 'six laugh' rule that I review by; i.e. if a film/show gets at least that amount of chuckles it can't be deemed a complete failure. My Son's Husband easily passes this test, wringing a moderate amount of genuine giggles out of me me. These gags aren't stretching the boundaries of comedy, but they are at least competent. For example: George has prepared his father for some shocking news, then reveals that he and Michael are to be married. Ignacio reacts with delight, then eagerly asks where the brides are. Upon being told that there's something he doesn't understand about the situation, he runs through an extensive list of what could possibly be wrong with a woman. Eventually he's gently told that the last 30 years have seen a social revolution that's expanded the ways that two people can be joined in marriage. He sits on the sofa, face sagging with realisation. "Oh my god." he exclaims. "She's black." This is just one of many solidly written and delivered gags sprinkled throughout the show. There's nothing here that's gut-bustingly funny, but this easy to tap into seam of mischievous, easy-to-digest humour runs through the play from beginning to end. That it's funny is My Son's Husband's saving grace, as dramatically it's riddled with problems. The most glaring one is that George and Michael have absolutely no chemistry with one another. Their love is the fuel that's powering this plot, and though they explain that they're crazy about one another, I never once saw a flash of attraction in their eyes. Indeed, for most of the play Michael is rather unpleasant, making it difficult to see what the far nicer George sees this grumpy sadsack. I suspect that this lack of chemistry is the result of some rather creaky performances, possibly exacerbated by actors not performing in their first languages. While the older members of the cast (playing the parents) all acquit themselves well, the performances of George, Michael and Laurie are flat and stilted. I have sympathy for these actors; to act in a second language must be nerve-wracking, but often you can tell that they settle for reciting the lines rather than performing them. Even here they occasionally stumbles: some of the faster paced sections of dialogue are indecipherable. Despite these flaws I can't bring myself to dislike My Son's Husband. As I stated at the outset it's a friendly, open and welcoming sort of show, one that's eager for the audience to have fun. It's got a good heart, and that goes a long way. My Son's Husband is at Theatro Technis until 14th February. Tickets here.